I'm starting on Wednesday, working as a supervisor in a little retail shop on the new college campus in Nantgarw. Minimum wage but it's full time and no weekends. I'm really looking forward to it but I'm a little anxious about having to be up in the mornings-I have to be there to open at 7.45am which means I have to be out of the house before 7am , drop Myf with my neighbour who'll give her breakfast and get her to school and get the bus. So I need to be up around 6am and I am terrible in the morning. I have invested in two new alarm clocks, one which should be loud enough and I'm getting myself up earlier in the mornings to prepare for it. The real trick will be actually getting to bed early-but I need to stay focused on how important this job is to Myf and I. I HAVE to be up in the morning. No other options. 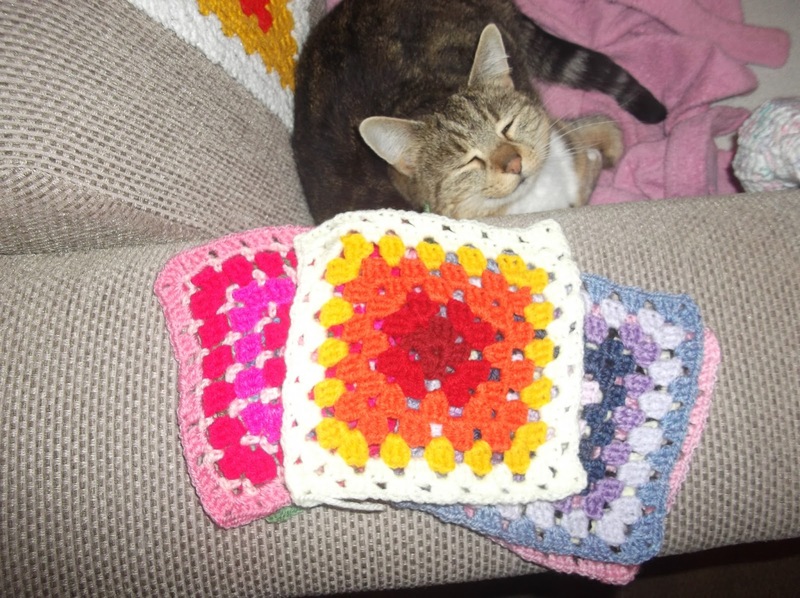 Anyway, aside from that exciting news, I've finished up another blanket that will eventually be sent to SIBOL. I have another one in mind and I want to send them together so this one will be staying here for a bit longer. I was inspired by the colours of Autumn-my favourite season and I love the different shades of green, yellow and brown. I completely forgot I had any dark green until I was doing the border but having just one layer of dark green around the outer edge really sets it off well. 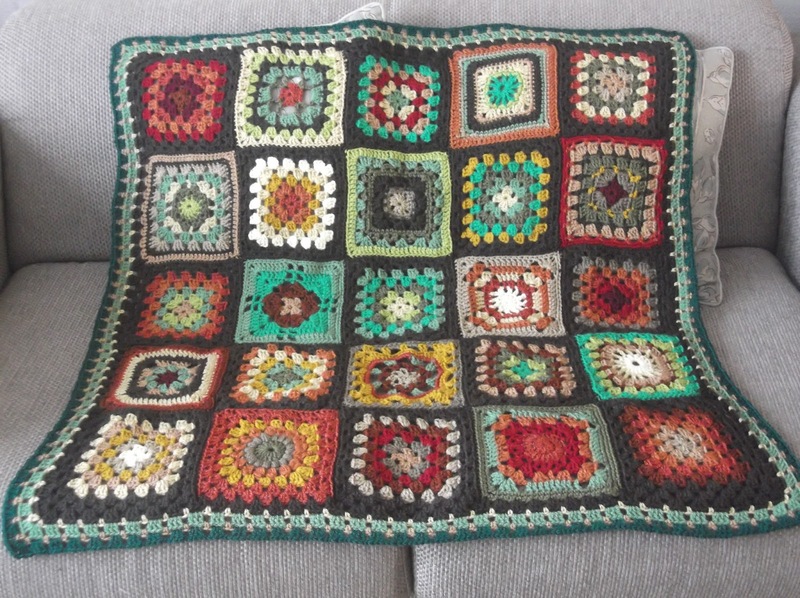 I think so anyway :-) I love this little lapghan, it'll be a wrench to say goodbye but I know Mrs Twins will find a loving home for it! Hmm, I posted last night and it hasn't come up on the blogger dashboard...very strange. It's there when I go directly to my page but for some reason, it doesn't show up anywhere on the dashboard. 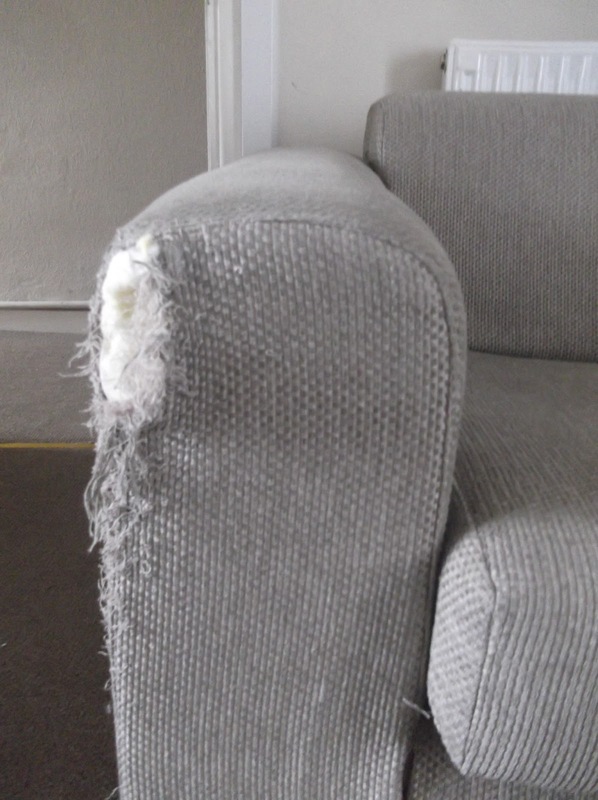 Plus, my photos seem to be a bit wonky. It's set to 'lightbox' so that when you click on the photo, it shows up overlaid on the page with a thumbnail underneath but now when you click on one, it shows the photo on another page as an image so you have to click the 'back' button to return to the page. I've checked the settings and they're still the same so I have no clue what's going on! Can anyone see this post on their dashboard? Do you have the same issue when you click on my photos? Any one else having trouble with their blog? Good evening all! It's blustery and chilly as well as a little damp here in Wales but at least we don't seem to have any more snow. It's a bit strange, being grateful that it hasn't snowed when it's nearly April but with the peculiar weather of late, it's hardly surprising! Hello everyone! Hope you are having a lovely Wednesday :-) Ostara is here and the light and dark are in harmony-from now, the day has dominion over the night so it's a time to reflect on balance, on growing strength, nurturing the seeds of new life. Myf is excited as her sister's 4th birthday is on Friday-being a big sister is so important to her but sometimes she struggles with the balance of it. In my last post, I showed you a finished baby blanket which really is more of a toddler/young child's size! They're coming to pick it up on Friday and they love the photos I've sent them but I thought I would surprise them with an extra blanket that's a better size for a newborn! 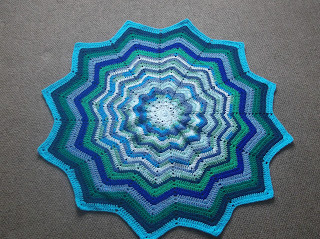 I'm been wanting to have a go at a 'ripple blanket' for ages and now seemed like the time to try :-) This lovely lady makes quite a few of these beautiful blankets and I've been admiring them for so long. She shares the pattern she uses-it comes from this site here. I had some variegated blue/green yarn left over that I couldn't think of a use for so the bulk of the blanket uses that up-I finished it off with two row stripes in each new shade. I need to practise the pattern so I can make it lie flat properly but I'm really pleased with it, especially for a first try! And it worked up so quickly, only took a couple of days. 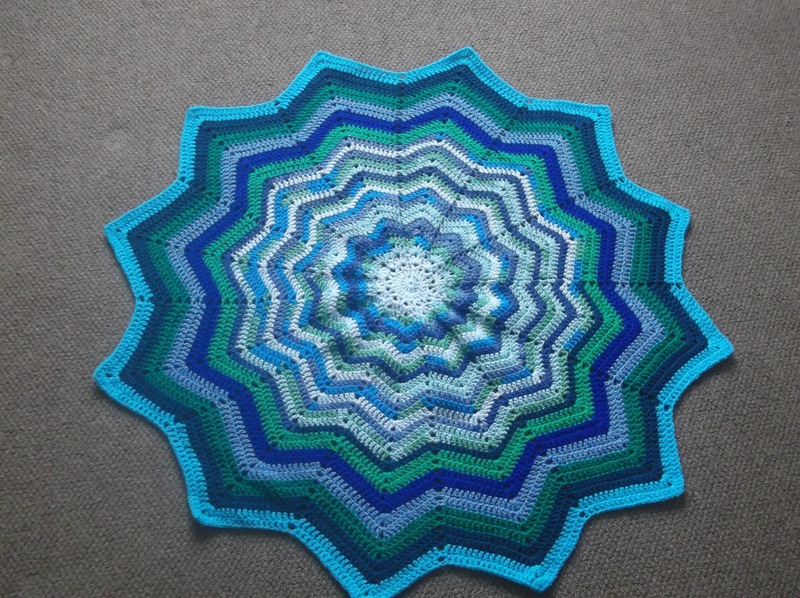 Once again, the cold Welsh winds are blowing but there is some sunshine at least :-) I've been working on a special blanket for my friend who is expecting a baby in May and I was very inspired by this beautiful piece made by the lovely Gillian. I love the bright colours and how the white edging gives it a fresh feel. So I decided I would try my own version in this style. 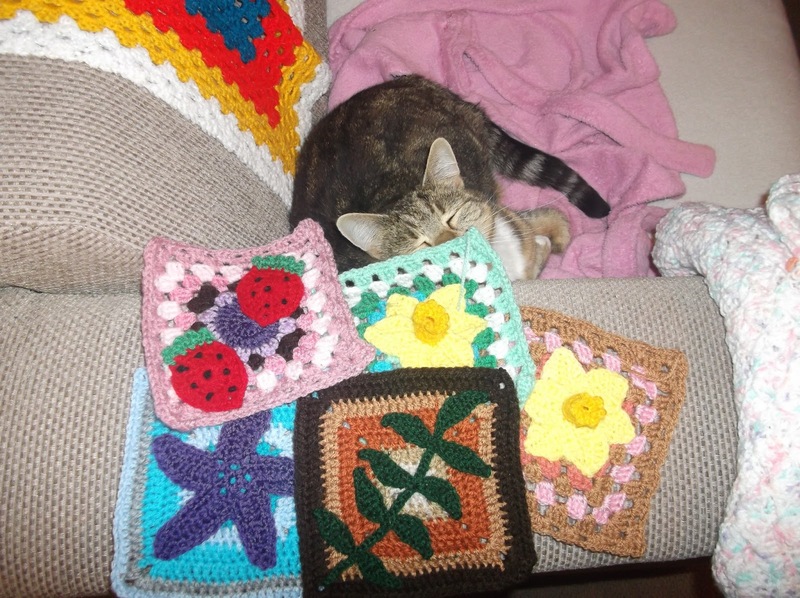 My friend Cat loves blues/greens-you may remember last year she wanted me to make her a special blanket to commemorate her Mum who has passed away. 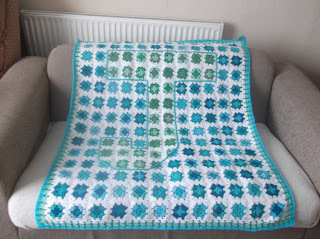 They've also already chosen the baby's name and wondered whether I could put the initial on the blanket too. 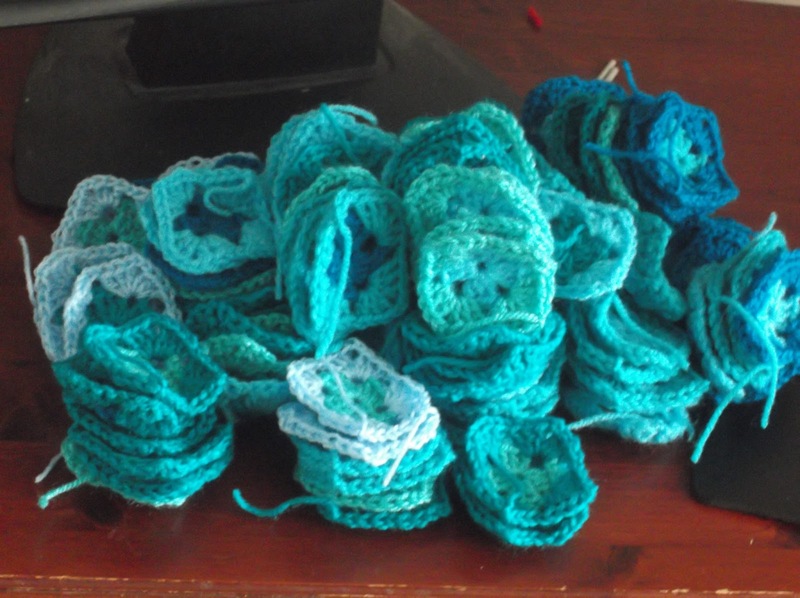 So I made a LOT of little squares...168! I used the same method as I do for joining squares-which is a bit tricky on the surface! It does stand out a bit more though so worth the extra effort. I also tried doing a chain stitch method in the border from this blog here. It's ended up being a LOT bigger than I planned-it measures approximately 36" by 45" so they should get years of use out of it! I'm pleased with how it looks, hopefully they will be too! Now, I'm finishing up a few squares for SIBOL and then I'm going to figure out how to do some repair work on my sofa! 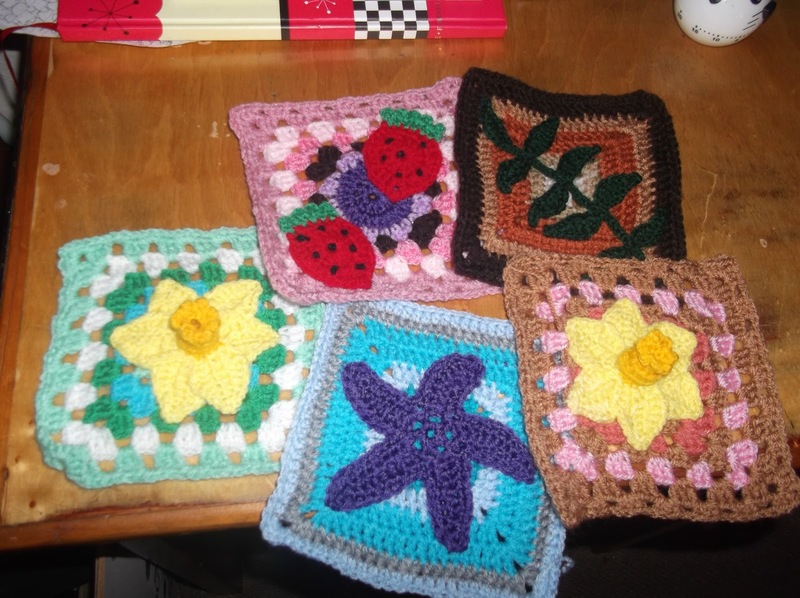 It's amazing to me that I've been crocheting for over 2 years now. 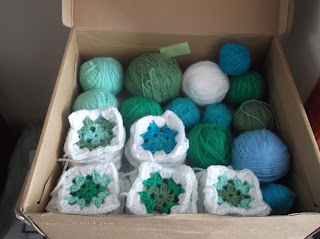 I still feel very much like a beginner-perhaps because I don't stray far from my comfort zone (Granny Squares Hooray!) but I was reminded recently that I'm not really a beginner any more-I should really think of myself as 'intermediate'. A lady I know through a close friend recently got in touch about some problems she's having with a crochet project. She's been crocheting for about a year and when she started, she wanted to make a baby blanket for her nephew. 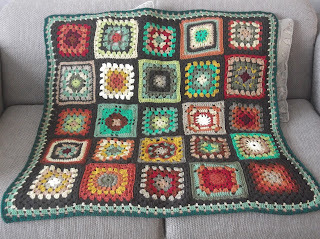 Well, she's been working on this blanket for so long, having to frog it and restart it over and over again that the baby is now nearly a year old and what was once a labour of love is now a massive burden. 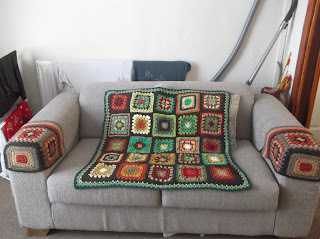 So she asked me whether I would mind finishing it for her (btw she suffers from EDH and her joints get REALLY painful after too much crocheting) and she brought round what she'd done along with all the yarn. It's described as an easy pattern and I suppose she's right. 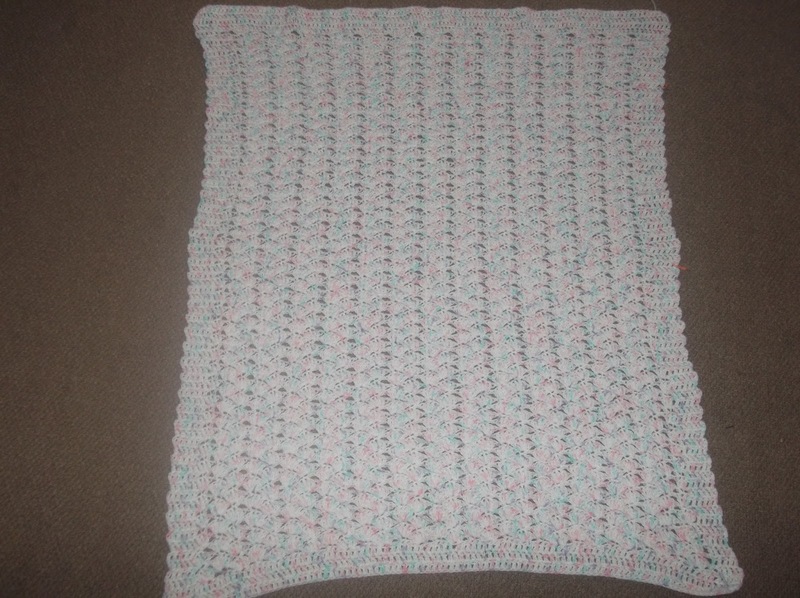 However, it's done almost entirely in single crochet so it takes FOREVER to make even a few inches of depth, let alone enough for a cot blanket. 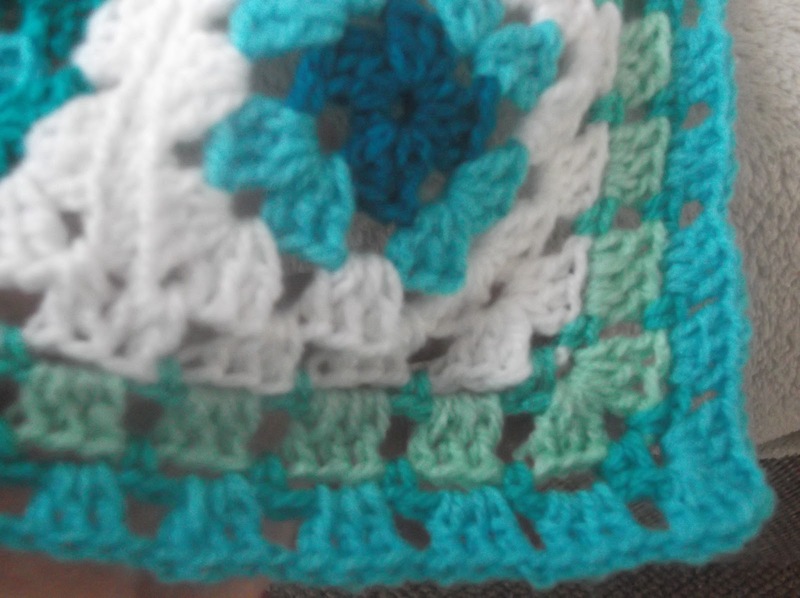 Plus, it is a 'self bordering' pattern and the way it's done is to alternate using single crochet and half double crochet for the first and last 5 stitches of each row. This tends to play merry hell with the width. 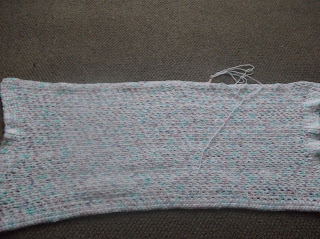 The main part of the pattern goes for a 'crinkle' effect by putting 1sc, ch2, 1sc into each space which takes even longer and the amount of yarn it uses is insane! 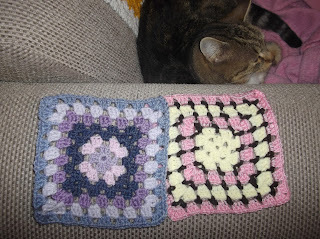 While it is a very easy pattern to follow, I think it needs some revision-a beginner trying to make a blanket from this would get disheartened very quickly! So, the first thing I noticed it that instead of putting 1sc, ch2, 1sc into each space, she was putting 1sc into a space, chaining 2 and putting the next 1sc into the next space so it wasn't looking right at all. 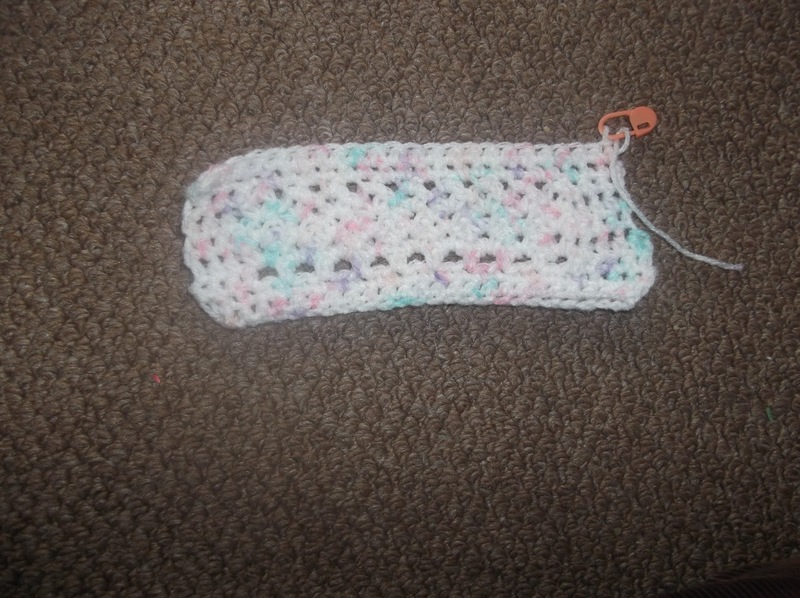 So I started from scratch and quickly discovered that it would take weeks of crocheting to get it to the right length plus for some unknown reason, it kept getting wider and wider! 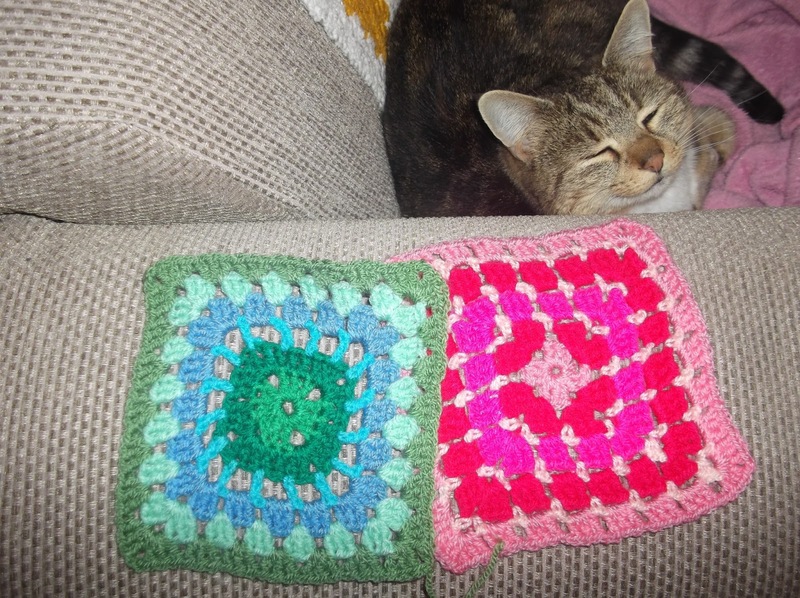 I spoke to her and asked whether she'd mine if I played with the pattern a bit. She was fine with that so instead of using single crochet, I opted for using double crochet shell stitches and changed the alternating rows to just dc stitches. The result was a blanket that didn't take more than a week to complete and has a lovely ripple effect. This is a little sampler of the pattern I made to show my friend what it should look like.